Mangaluru, Mar 23, 2018: City Crime Branch (CCB), in a joint operation with personnel of the Mulki police station on march 22, Thursday, cornered a notorious gang of car thieves. A total four accused were arrested in this connection, including the kingpin in a fake registration certificate (RC) racket. Police seized five cars valued at Rs 50 lakh from their possession, city police chief T R Suresh said, adding the arrests were carried out based on definite information about the gang’s presence in the Mulki police station limits. Police made the breakthrough with the arrest of Fayaz, 34, who was spotted driving a car that was reportedly stolen from Ullal police station limits, earlier this month, during checking at Bappanadu check post. 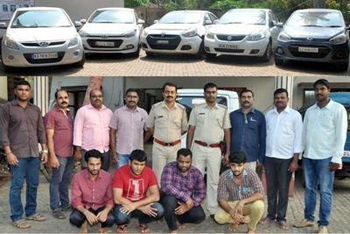 Based on information provided by Fayaz, police zeroed in on three other accused at Mukka under Surathkal police station limits, and seized four cars, which were allegedly stolen by them. Fayaz of Ballari is part of a notorious fake RC racket operated by Kukkaje Abubakkar Sadiq. The other accused are Rohan Shailesh D’Souza, 31, of Ullal in Mangaluru taluk, David Clinton, 22, of Rayee village in Bantwal taluk and Eesa Roshan, 37, of Valencia in Mangaluru. Suresh said cases of cheating have been registered against these three accused in Ullal and Panambur police stations. He lauded the operation carried out by police inspector Ananthapadmanabha of Mulki police station and Shantharam, police station, CCB, and their respective staff, under the supervision of senior officers.